I love trying new eats and drinks and learning about different kinds of foods and flavor combinations. It is one of my favorite things in life! A few years ago, I was curious about a drink on the menu at Gjelina Restaurant in Venice, California which was described as a fruit-based drinking vinegar. Huh? But the waiter convinced me that this so-called “shrub” was quite refreshing, as well as tangy and delicious. I am a huge fan of apple cider vinegar and I often add it to my water during the day. So I figured a shrub wouldn’t be too far off. I instantly became obsessed! The shrub was my new favorite drink. I learned a bit more about shrubs which can be made with almost any seasonal fruit, with or without sparkling water, and with or without alcohol. According to Serious Eats, “the sugar, acid, and optional alcohol preserve the fruit juice, and in fact that was one original purpose of the shrub. Prior to the invention of refrigeration, a shrub syrup was a means of preserving fruit long past its picking. Shrubs were popular in Colonial America, mixed with cool water to provide a pick-me-up on hot summer days. 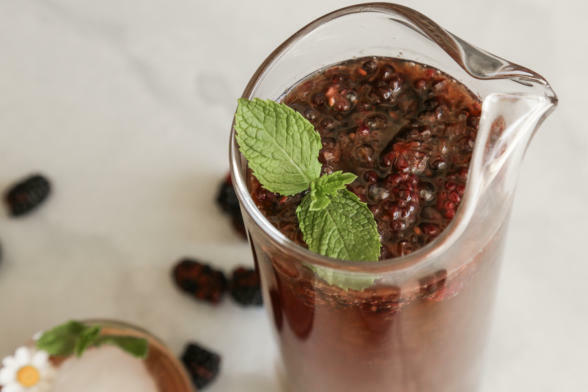 A proper shrub has a flavor that’s both tart and sweet, so it stimulates the appetite while quenching thirst.” Soon after I learned about shrubs, something called “drinking vinegar” by Suja came on the market. I think it’s basically a shrub. If you’re looking for a new summer drink, this is a fun one to try. 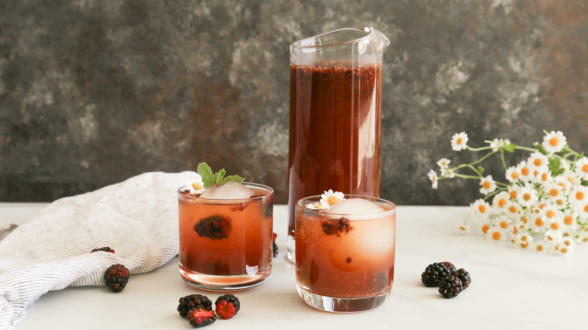 I served this blackberry shrub to some girlfriends a few weeks ago and they all loved it. Some drank it straight over ice and others added a little vodka to their glasses. It is based on a recipe in Sunset Magazine’s feature on Jenni Kayne last month. I followed the recipe exactly using coconut sugar, but I have a feeling the magazine shot the recipe using cane sugar since coconut sugar is dark brown and gave the shrub this brownish color. If you are ok using cane sugar, I think the color of the drink will be a little prettier. Shrubs can take on limitless flavor combinations, including berries, stone fruits and melons with any number of herbs and even different vinegars like cider vinegar and red wine vinegar. Other flavor additions can be cinnamon, nutmeg or cayenne, ginger, vanilla or almond extract. The key is the combination of sweet and tangy, so the sky is truly the limit. Just start with your favorite fruit, or whatever is in season, and be creative! I would love to see what shrubs you all come up with so be sure to tag me @pamelasalzman #pamelasalzman on Instagram! My next online course will be released in the next few days. You will go crazy for this Mexican-inspired menu. It was a major hit in my classes! Make Syrup: in a medium bowl, mash blackberries with sugar, using a fork. Let sit about 15 minutes for fruit to get juicy. Stir in vinegar. Cover and chill, covered, 3 to 5 days for flavors to meld. Strain syrup and transfer to a jar. To make Shrub: For each serving, pour 1 oz. syrup into an ice-filled glass. Add 5 oz. sparkling water and stir to combine. Or combine all of shrub and sparkling water in a large, ice-filled pitcher. 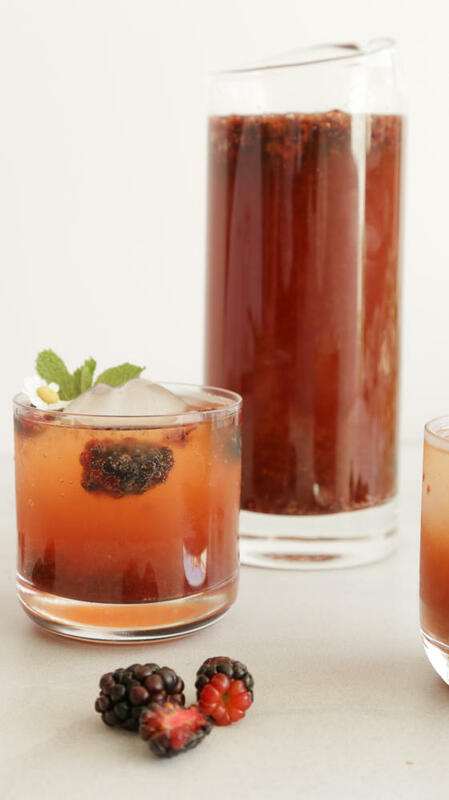 Top glasses with blackberries and add an herb or flower sprig. MAKE AHEAD: The shrub syrup, chilled airtight, up to 1 month. *Coconut sugar gives the drink a more brown tint. If you want the drink to be more deep purple, you will have to use cane sugar.